There are many charities, good causes worthy of our support, there is however one charity that I feel stands out as being especially deserving of your support! Although there is a dedicated website I am supportive of the appeal and wanted a page to add my own website. 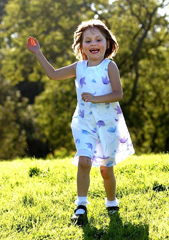 Megan Armstrong, is a seven year old child from Northumberland who was born with a cancerous brain tumour. This one statement alone cannot begin to explain the problems she and her family have fought. Megan had problems from the outset and lost weight dramatically. Limited attempts were made to diagnose the problem without success, this was only the start of the families troubles. 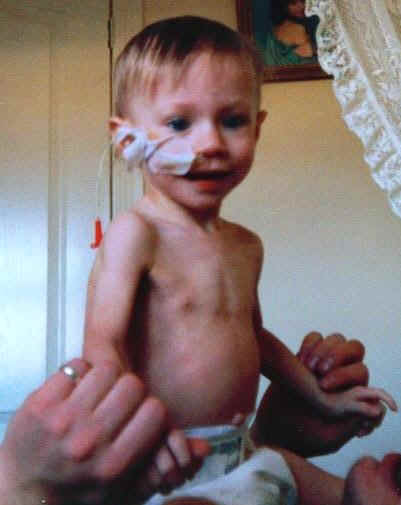 When Megans health did not improve her parents "Philip & Sandra" had to fight preposterous allegations of child abuse / neglect, so much so that at one point the authorities secured an order allowing the removal of Megan. It was only at the eleventh hour that a different hospital was finally able to accurately diagnose the problem! Since being diagnosed with a malignant brain tumour Megan has been fighting a truly courageous battle. She has already had surgery to her brain on 4 occasions, underwent approximately another 10 operations to her stomach and chest and has had over 100 general anaesthetics. Megan's parents would be the first to point out, that Megan is not unique, indeed "Philip and Sandra" indicate that there are thousands of children, just the same as Megan with brain tumour's or another form of cancer! 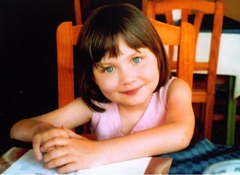 In August 2002, Megan's parents set up the "Megan Armstrong Cancer Appeal" so that if the medical professionals looking after Megan ever said that there was nothing more that could be done for her and to go away and enjoy the remaining time left with her before she would die they could look at other countries that might perhaps offer Megan a chance of life. Maybe through some pioneering treatment or surgery, not yet in use, perhaps still at a trial stage. Megan's Appeal is an unregistered charity not by choice, as to become a registered charity you have to be collecting for a multiple of people afflicted by the same illness, or affected by the same disaster. As they are primarily fundraising to benefit Megan they do not meet the necessary criteria to become registered as a charity. This has however, closed many doors to them leaving them to relying heavily on individual support. Megan was diagnosed in the Newcastle General Hospital at 7.45pm on Friday March 2nd 2001, at that time the brain tumour was a third the size of Megan's brain. Initially the consultant and doctors at Newcastle General who took over Megan's care had two major things to work on. 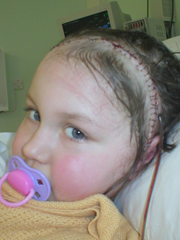 Firstly to prevent Megan from going into organ failure, at this stage she was only about 4 weeks from dying due to multiple organ failure, and secondly how best to treat a very large brain tumour. Within a few days Megan had a central line inserted and she was commenced on what was to be a 13 month course of two different Chemotherapy agents. Megan was also put on TPN as a feeding process straight into her blood stream to bypass the tumour's effect on her ability to eat. Megan initially responded well and the tumour shrank by approximately 50% by the end of the 13 month course of Chemotherapy. However in October 2002 a scan showed the tumour was still cancerous and had grown back to approximately it's original size. Megan was started on a six week intensive course of daily Radiotherapy which ended in Jan 2003. Megan endured a general anaesthetic each day to put her to sleep so that she could be perfectly still during the radiotherapy delivery. It was extremely risky to deliver radiotherapy to someone as young as Megan as but Philip and Sandra knew it was her only chance of survival and agonised over having to go down such a dangerous route. The Radiotherapy has left Megan with some severe problems, the radiotherapy dissolved parts of the solid tumour mass into a liquid form, necessitating two emergency brain surgery procedures to drain fluid from the ventricles in her brain. To this day Megan still has a shunt in her head for draining this fluid although it is now largely redundant as it is out of position due to Megan's growth. 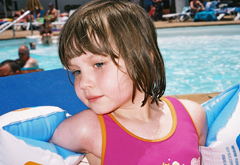 Megan remained in remission for 25 months having MRI scans at 3 monthly intervals, Megans parents started to believe that we they had gotten got through the nightmare ordeal. That Megan was to have her future, until a routine scan on the 17th February showed the tumour was had grown back and still cancerous. Megan underwent more invasive surgery on the tumour on the 5th April in Newcastle General Hospital. It was initially believed that the surgery had gone well however, Megan suffered post op seizures and two days after surgery lost sight in her right eye, she now has only approximately 20% vision in the lower visual field of her left eye. A scan on June 2nd 2005 showed that despite the surgeon thinking he had removed approximately 80% of the tumour, the figure was nearer 40%! At this point a second opinion was asked for to determine the best way forward? The Alderhey Childrens Hospital in Liverpool and St. Judes Childrens Cancer Research Hospital in Memphis, USA, suggested Megan undergo a course of Vinblastine Chemotherapy, to be delivered by weekly injection at Newcastle General Hospital. Philip and Sandra have had it made clear that Megans only real chance of a cure will be if she undergoes radical major brain surgery even though it is by its very nature extremely dangerous and highly life threatening. Megans parents are focused taking each week at a time and will deal with the decision as to whether such complex surgery is needed only when faced with no other option, a decision that they know they will be faced with sooner or later. Various adaptations have been made to her home to aid Megan's safety and she started training with a white stick to enable her to enjoy the some degree of independence. The surgery in April 05 also damaged her hearing, and leaves her with little tolerance to loud noise. Megan has also suffered a partial stroke and she some weakness down her left leg. Megan receives hormonal treatment every 10 to 12 weeks problems caused by the tumour and has some brain damage as a result of the radiotherapy. 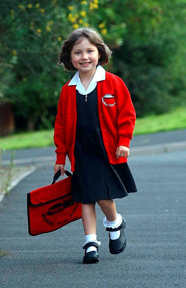 Megan has experienced some learning difficulties and has a Statement of Special Educational Needs along with an individual education plan tailored to her learning ability. The Vinblastine Chemotherapy treatment is particularly traumatic for Megan as she is now extremely phobic of needles and as the injection is delivered to her into a sportscast in her chest the weekly visit to hospital is extremely difficult. Megans parents have been told that her only real chance of a cure is to undergo "massive, radical brain surgery" on a scale far greater than she has had before. Such surgery runs very high risks of mortality, disability and would almost certainly remove the remaining sight Megan has. They know that every day they have with Megan should be treasured are working hard to try to find the right balance of having a normal family life, work, school etc not just for Megan but for the family members. Megan's Plight has been recounted on the BBC and ITV new programs throughout the "Tyne Tees" region and this is where I first learned of her troubles, although we missed her contact details. We were fortunate enough to see another television report and this time we were able to identify the website details. Looking at the dedicated website it was clear that Megan has had the support of some high profile individuals, however, it is still so important to keep up the fund raising activities. I have permission from "Phillip and Sandra" to reproduce some of the information from their website in order to produce this web page. Part of the information I wanted to add is some of the fundraising supporters that have given freely of their time. Paul & Sarah Mead - "My Special Angel" CD, Copthorne Hotel, Football match and much much more. Ray Mewse - a treasured 73yr old ray who walked 192 miles on the Coast to Coast walk for Megan. Paul Gascoigne & Jimmy Gardiner, Sir Elton John, Wayne Tunnicliffe, Stu Smith, Marky Mark, Bob Moncur, Jimmy Montgomerie, Wayne Dance, Lisa Sewell, Dave & Lisa from Hull, Maggie, Monica & Walter, Anne Leach and so many more! Dr. Clive Cussler who despite his very many commitments gave gratefully to the appeal in a very unexpected and generous way. I would urge everyone to visit a dedicated website for the Megan Armstrong Cancer Appeal for themselves where much more detailed information can be found, especially that which details specific problems the family have endured. Phillip and Sandra believe that every penny raised may some day pay to save Megan's life and give her a better quality of life. Megan's parents have always said that if she ever wins her battle and is cured then every penny will be donated back to those who supported the family, organisations like The Rainbow Trust, Sergeant Cancer Care and Ward 24 of the Newcastle General Hospital. So far Megan's parents have used over £1,300 buying equipment asked for by Ward 24 as well as presents for all the children on the ward each Christmas and Easter since the Appeal was launched. A further £2000 donation was made to the Rainbow Trust. Hopefully if you have the opportunity to visit Megans website and read all there is to read then like me, you will feel touched by Megan's plight and her brave battle, so much so that you will give her what support you can. The Appeal is something Megan's parents do around work and all other aspects of family life, supported greatly by a fantastic network of friends and neighbours, but it is all voluntary and unpaid, they don't have staff and work from home on the appeal. They need as much support as possible so please, tell your family, friends, work colleagues and anyone else you can about Megan and her appeal!